When I sat down next to Tyler he put his arm over my shoulder teasing Brendon. Brendon just glared and walked to his bunk. I sat and talked with Tyler and josh for a while then I went to my bunk and closed my curtain. I grabbed my sketch pads and pencils and started looking through my drawings. Then I got an inspiration from Brendon&apos;s music video to Girls/Girls/Boys and decided to draw it. (A/N) The pic above) It was a bit hard without looking off a pic online but I did it. First I did the head outline and I built off from there. Then, as I was checking it over making sure everything was right, Brendon opened my curtain and I jumped and quickly hid my sketch book. "What&apos;s behind your back?" He asked. "o-Oh...n-noth-nothing! I-its nothing!" I stuttered. Brendon was curious but tried to ignore it. "Hey, so I&apos;ve been thinking. I was wondering. Well, would you...ugh" He says scratching the back of his neck. "would you maybe like to go out to dinner tonight?" He asks nervously. I was blushing a lot. "Y-yeah, I would love to!" I said as Brendon helped me off my bunk and I had completely forgot about my sketch pad as I ran to the bathroom to do my hair. When she had gone to do her hair the thing behind her back had fallen to an open sketch of me from my music vid Girls/Girls/Boys. I was impressed. It was amazing. It was perfect. I had the feeling of looking through the rest of her sketch book but I didn&apos;t want to be a snoop...ill just give her an excuse to show me her sketches. I took the drawing out to the other boys to show them. "Guys, look what (Y/N) drew! Isn&apos;t it perfect?!" I said. "Wow! She drew that?!" Tyler asked. "Yeah! aren&apos;t you guys following her social media? She has a ton more pics of drawing of us three." Josh said. Tyler and I looked at him in awe. "I am following her social media! I haven&apos;t seen any drawings from her!" I said. "Yeah me too" said Tyler. The bathroom door opened and when she saw the drawing she blushed and jumped in to her bunk closing the curtain. I was so embarrassed. I felt like he thought I was a stalker or something. Of course I do know everything about him but not the point. I hide myself in my bunk and burry myself un a big fluffy blanket and try to hold back tears as I hear the boys walking over. "(Y/N), a-are you ok? What&apos;s wrong?" Brendon asked knocking on my bed siding. I didn&apos;t say anything. I couldn&apos;t say anything. I was too embarrassed. "(Y/N), please come out. We don&apos;t like it when you hide. I know the paste couple days have been rough but you cant hide forever." Josh says. I still stay quiet. I wasn&apos;t that embarrassed in front of Josh or Tyler but around Brendon I was. "Listen, (Y/N), your art is amazing. I have never seen someone as amazing as you. Please, we just want to talk art." Josh says again. "Guys, give me a minute alone..." I hear Brendon say to the other guys. 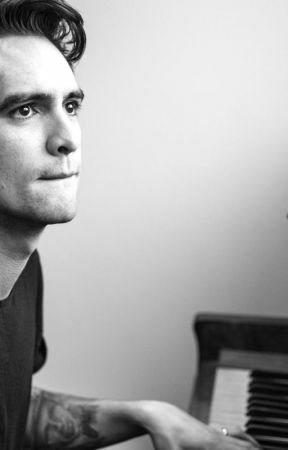 They walk away and Brendon opens the curtain without knocking and im hiding my face in a blanket. He hops onto the bed with me and holds me tight. "(Y/N), what&apos;s wrong? I-im sorry if I wasn&apos;t supposed to look at it. But it was amazing and I just- I-" Brendon said but was soon stopped when I had moved the blanket from my face and I kissed him long and hard for about a minute but then I pulled away as I knew it was probably too long. "(Y-Y/N), I-I don&apos;t know what to say...I-" He said. I didn&apos;t know what to say either. It had felt like some weird brave part of me took control and told me to kiss him. All I could do now was cry and plant my face in his chest. He rubbed my back slowly and he had kissed my head. "I love you" He said. I stopped crying and looked at him frozen. "Y-you d-do?" I asked. I know I had sounded stupid but oh well. "Yes, I wouldn&apos;t tell you if it wasn&apos;t true. " He said. "I-I l love y-you t-too" I said. He blushed a little and dried my tears. "BEEBO&apos;S IN LOVE!" I heard Tyler shout from the other room. We all chuckled. "Now, can we talk about your art?" 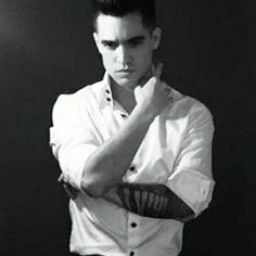 Brendon asked. I blushed and scratched the back of my neck nervously. "Uh, S-sure" I said.